The nation’s source for large diameter steel pipe, Mandal Pipe Company supplies multiple industries, including: Gas Transmission Pipes, Foundation Pilings and Caissons, Power Piping, Dredge and Slurry Piping, as well as Hollow Structural Sections (HSS) and Spiral-Welded Steel Pipe. Different industries call for different designs and processes. We have the experience to supply the material your project requires. With strategic stocking locations across the country, we supply the material your project needs, quickly and efficiently. Mandal specializes in large diameter steel pipe for onshore gas transmission and offshore drilling where extreme conditions are the norm. Expect on time delivery, with quality material, complete submittals and impeccable traceability for your bracing, caissons and piling. 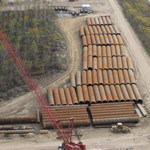 Mandal Pipe Company is a major distributor of large diameter steel pipe with stocking locations in Atlanta, Georgia, Houston, Texas and Steelton, Pennsylvania. With these strategic locations, Mandal is uniquely positioned to service the needs of the gas transmission and offshore drilling industries, as well as the foundation piling and drilled caisson industries. Mandal also supplies the general services industry; including power piping, dredge and slurry piping, casing and structural piping, and Hollow Structural Sections (HSS).